You’ve probably noticed the lane restrictions on Meridian Street, as well as bus station foundation popping up in various parts of the city, as part of the Red Line Project. 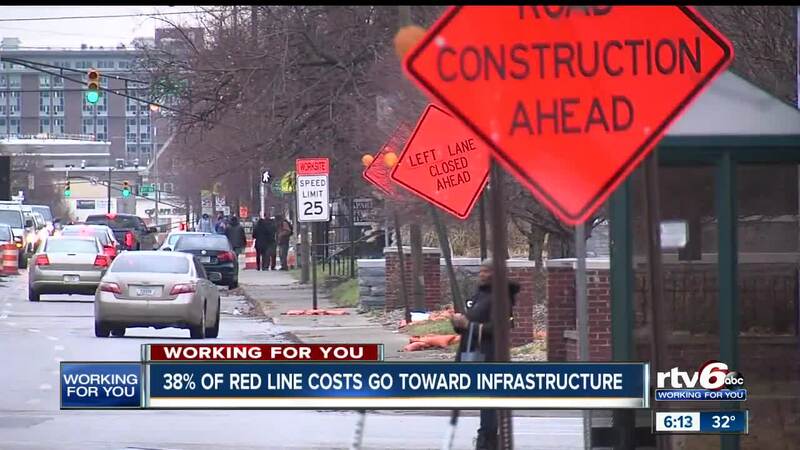 INDIANAPOLIS — You’ve probably noticed the lane restrictions on Meridian Street, as well as bus station foundation popping up in various parts of the city, as part of the Red Line Project. The project comes with a price tag of about $96.3 million, but what many people don’t realize is that more than 1/3 of those costs (roughly 38 percent) are for infrastructure improvements, in which pretty much everyone is impacted. Right now, the majority of the work you see happening is for these improvements, along Meridian Street, College Avenue, and Capitol Avenue. So here's that cost breakdown: $2.6 million go to sidewalk repairs; $5 million go to repaving and repatching; $5.4 million go to drainage improvements; $13 million go to the 13 buses ($1 million each); and $100,000 go to landscaping and bike racks. All of which will impact everyone: drivers, bicyclists, and pedestrians. "You need to have a safe space to get to and from the bus station so sidewalks baseline were really important to us," said Lauren Day, the director of public relations for IndyGo. "And if you think about the infrastructure around the station, how the drivers are getting around the stations, the bus only lanes, bicyclists as well, it was really important that the full infrastructure around the Red Line corridor was improved as well." Another part of that 38 percent, about $4 million worth, will go to traffic signals. "We're upgrading traffic signals for a lot of the bus-only lanes," Day said. "And the buses themselves that will operate on the Red Line, they're going to have what's called 'transit signal prioritization,' which helps move the bus signals a little bit faster, so it doesn't change it to a green, but it will hold it a bit longer so we can keep that 10-minute frequent service." According to Day, the hope is for all of the utility and infrastructure improvement work to be complete by spring of next year, and then it'll be strictly Red Line Construction. IndyGo said the hope is for the Red Line bus service to be up and running by the end of the summer in 2019.